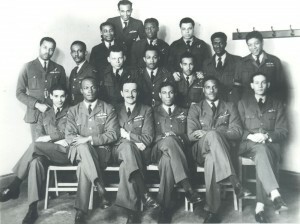 Picture right: A mixed group of RAF-officers. I have read the above with interest. I am the niece of Osmond Kelsick, my uncle (Father’s broter) who was a squadron leader and awarded the DFC Kindly correct the spelling of his name – Osmond and not Osborne – as indicated above. what was it like in world war 2? what was it like when you crashed? I believe that I am a relative of the Hon. Ulric Cross as I am the grand-daughter of an uncle, Henry Cross, of Port of Spain. My mother, Rose Jordan Cross told me the story of her famous first cousin, the Hon.Ulric Cross, whom she was very proud of as a child in Port of Spain. Hopefully, I will meet this famous man on one of my trips to Trinidad and Tobago. i am proud to be a trinidadian, to know hon. ulric cross who fought for the freedom of world also the others whom have died in doing so. I am Anne Cross, Ulric’s niece. I read the note from Catherine Brooks. Henry is related. I would like her to contact me. If you could please forward my e-mail address to her. and met my Mother Williamina Jane Ross also served in the RAF during World War Two. My Mother died in Glasgow in 1949 when I was only 3 years old. I never seen my Mother or Father I have not seen any of my Children either. Ulric was my first boss in the early fifties, when I was 17 and he was a BBC producer in the BBC Overseas Service. If you are reading this, Ulric, I should love to hear from you. since 51 years. I see my Uncle Ulric on a regular basis, he has stayed with us here in Germany quite often.I have been also doing some research on his Father’s family who emigrated to the USA. I have found some and know that a Henry Cross (his father’s brother) married a Scottish lady, had 3 children (who I think passed away) and their `children live maybe still in England. I would like to contact Catherine V.Brooks who according to her details, may be the missing link to the Ulric Cross family ties. Please contact me,Sonia Anderson-Cross, at the above given email address. This would be a “WOW” if you are the missing family. Firstly may I congratulate you on such an excellent website. Many people forget what a truly international force the RAF was during WWII. Sadly the march of time means that fewer pathfinders attend each year but it is always touching to see the high regard that the veterans are held but current RAF personnel. Feel free to use the photo f you wish. My apologies for the typos! I remember Mr Cross as a child in West Cameroon, when he served as that country’s Attorney General. I ran a couple of errands to their residence for my mother. I did not know what a distinguished man he is, though he looked very intense and intelligent back then, even in the eyes of a child. I am working on a Documentary that includes Ulric Cross DFC.DSO, The Documentary is about people of colour who fought in the wars, on Briton’s behalf. I met him in the UK 2 years ago and then again in Trinidad last year. He is a great role model for people of all ages and colour, and I feel privilege to have met him. I found him to be factual,with a great sense of hummer and wish him nothing but the best. It is with great sadness that I learnt this morning that Ulric Cross died yesterday afternoon Friday 4th October, peacefully at home. Funeral announcements have not yet been made. Sorry, I am posting using iphone and copy/pasting very fiddly! I am so sorry to hear of the passing of that great man, Ulric Cross. I have fond memories of him and his infectious laughter. My sympathy to his family. Dear Mr. Lee we join with you and all those who engage in the preservation of our noble Caribbean heritage by extending our condolences to the Cross family. I just got word from Nicola Cross that her father RAF WW II hero Phillip Louis Cross had died in Port of Spain, Trinidad at 96 on October 4, 2013. 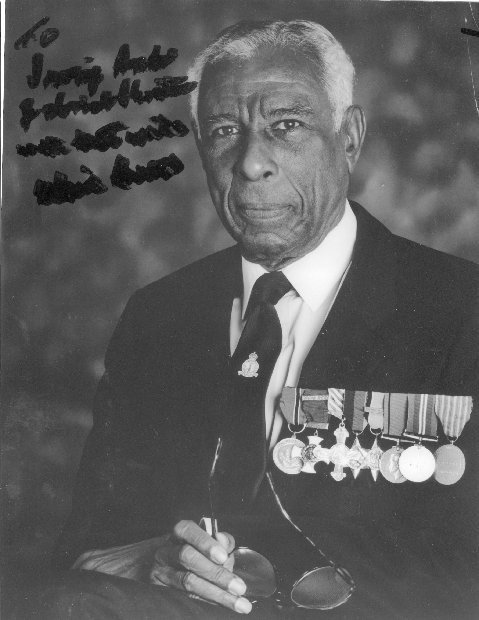 Cross who later became Attorney General of Cameroon, and an esteemed judge in Ghana and Tanzania had – in 1941 – rushed to the defense of Britain in what Prime Minister Winston Churchill called its darkest hour. After the war he became a leader in the legendary West Indian Student Union (five of whose board members became Prime Ministers) and did West Indian and other programming on BBC – or so I was reliably informed by him and others in the know. 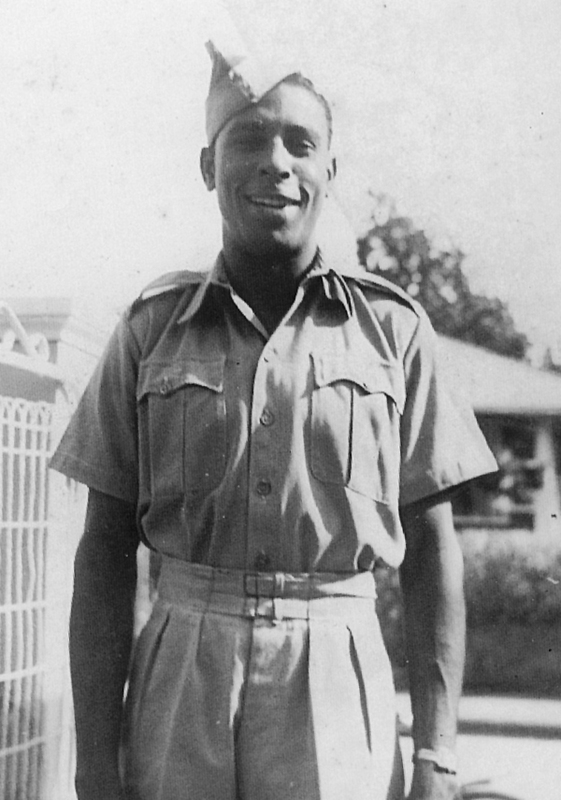 There is actually an old film from WWII filmed at the BBC studios in which a young Cross, in RAF uniform, addresses the West Indies, alongside the great West Indian cricketer Lord Learie Constantine. 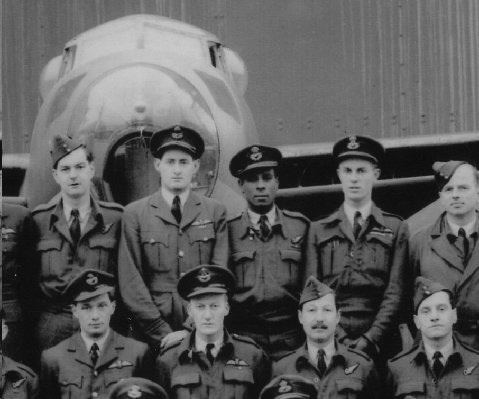 Cross was the highest ranking West Indian World War II veteran still alive (until yesterday) and certainly one of the few officers left of the legendary 139 Pathfinder Squadron of RAF Bomber Command. I have been advised by Nicola Cross that there will be a memorial service at the WWII RAF Memorial square in Port of Spain on Friday, October 11, 2013. We here salute Hans Klootwik for his selfless duty in maintaining this site, as with Mr Kelshall and Lee in Trinidad at the Military Museum. May the soul of Squadron Leader Cross rest in peace. I am Carol Mayers, the daughter of Uncle Ulric’s only sister (Dorothy Anne Mayers). I am so grateful for this site and it’s articles. I am learning history about my Uncle and members of my family tree that I knew nothing about. I sure would like to know more. My Uncle lived a full life to tell the stories of WWII. The 2nd row 1st on the left is my Dad, F/O Egbert A Gordon from Jamaica. 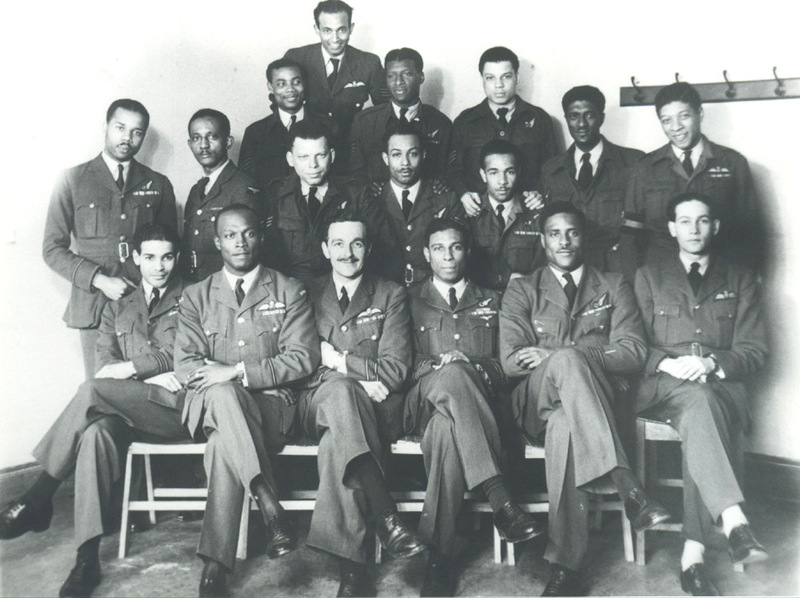 He left Jamaica to join the RAF with his lifetime friend, Vincent A Bunting and they flew and served with distinction together. Both married British ladies and had British born children, Dad had 3 in England 1 in New York, Vin had 1 in England, 1 in Antigua and 1 in Jamaica. At the end of the war, Dad took his family to New York where his Mother had migrated, and Vincent Bunting moved to Antigua, and then later back to Jamaica. This photo has always been in our family along with many more from Dad’s RAF days and we are proud of his service and to identify our loving Father on this site. Kindly contact me at 301-218-9400; as we flesh out the history of the RAF veterans of WWII we would welcome your cooperation, to include photos and memoirs. Thanks and God bless your Dad and the other veterans who sacrificed much so we would enjoy freedom. Dear Ms Gordon, The Trinidad and Tobago Branch RAFA No 1075 is trying to make contact with members of the RAFA Brooklyn Branch No 1255. Your dad Flt Lt E. Gordon was once President of this Branch. They visited Trinidad sometime ago and I would like to get more information on the Branch, whether or not any members are still alive and contact information etc. I knew Ulric in the Cameroons in 1962 and I remember him well as man of immense charm and intelligence. I thought I did well when I occasionally beat him at squash, little knowing then the he was 18 years my senior! Rest in peace Ulric, there are very few like you. 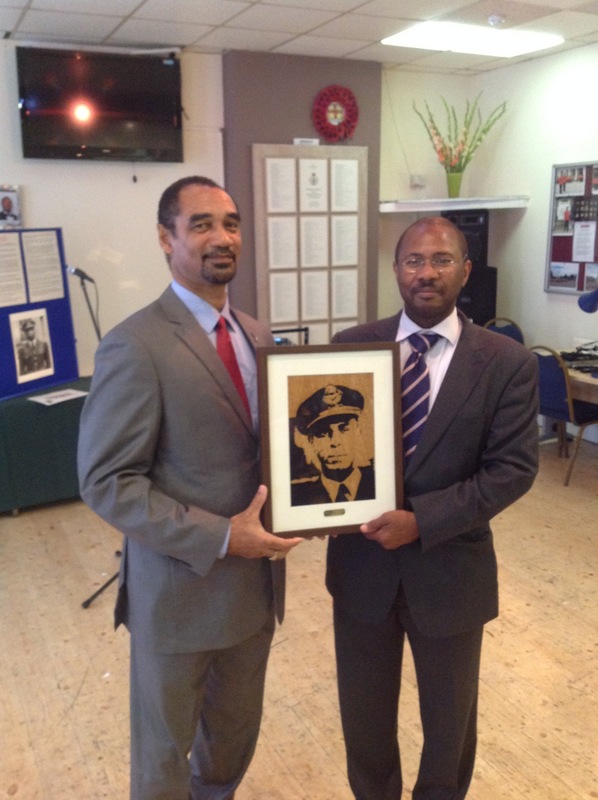 On Sunday 29th of September,2013 the WEST INDIAN ASSOCIATION OF SERVICE PERSONNEL held a march and parade in windrush square Brixton, London. There after there was a reception at our premises honouring the life of Sir Ulric. 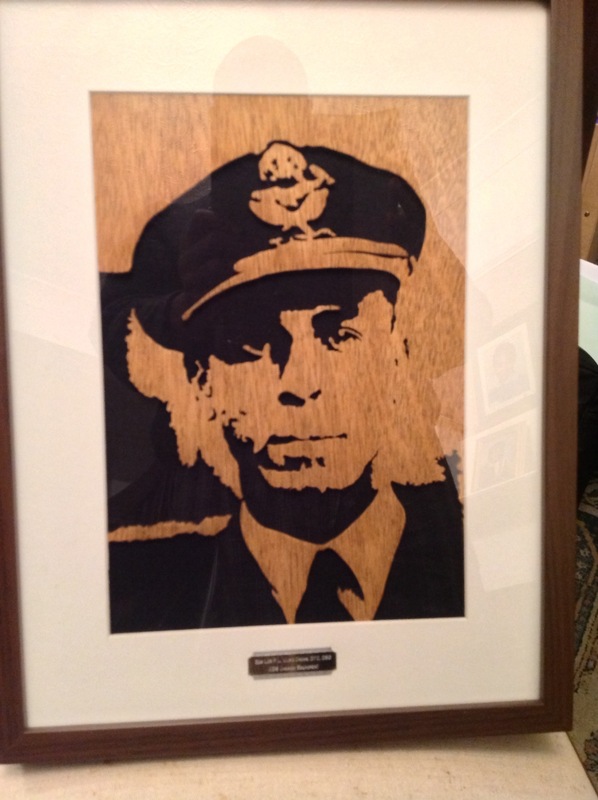 At the reception we presented a recent portrait of him made from wood which was unveiled by David Hickson Of the Trinidad and Tobago High Commission. We also renamed our hall THE ULRIC CROSS HALL. At the time we did not realized how significant that day would become for us in five days time. We are honoured to have done this before the 3rd of October. Ulric Cross was my godfather, a friend of my parents in Trinidad. We left for the Gold Coast (Ghana) and he came later in 1957-58. I remember him as a guest in our house in Accra. To charm us children, he put on the ‘Two Little Dicky Birds’ show, with pieces of paper stuck on his fingertips. I still have the sound of his voice, droll and serious, in my ears as he said: ‘Fly away Peter, fly away Paul, Come back Peter, Come back Paul.’ When I tried, Peter never came back and Paul never flew away! The grown ups had wonderful parties at the time. In 1992, my parents went for a holiday in Trinidad. When they got to London, they couldn’t board without a visa. Travel agent’s fault. British West Indian Airways hired a taxi to take them to get a visa from the Trinidad High Commissioner – who turned out to be their old chum Ulric. They arranged to meet him in London on the way back, and caught up. I am not sure that other events recounted by my mother now age 94, are the reality – she claims some of the information published by him is not true. If anyone is doing research or a biography on him, I don’t mind passing on one or two things to be checked. My parents kept in touch for a long time. He was a great guy. Ulric Cross was a great man in my eyes. I met him while in the process of to make a Documentary about Caribbean Air Crew and Soldiers. I met him on one of his last trips to London, in order to collect a medal at one of the Embassy’s. After visiting the Embassy, I interviewed him for the Documentary. He was intelligent, articulate, had a great sense of hummer, immense charm, with a quick mind even at his great age, I felt privileged to have known him. I spoke to him in September, my last words were that “I will speak to you in two weeks” that did not happen unfortunately. I feel a void now that he has gone, not only because I met and spoke to him, but because the world has lost a great guy. Rest in Peace Ulric you will be greatly missed by all. I am still trying to contact Catherine V. Brooks, who appears to be a member of the Ulric Cross family. I am Sonia Anderson-Cross, my Uncle Ulric’s eldest brother “Urban’s” daughter. Please send her my email address. Thanks so much.